I have a new sewing machine. Here it is, in all its glory. 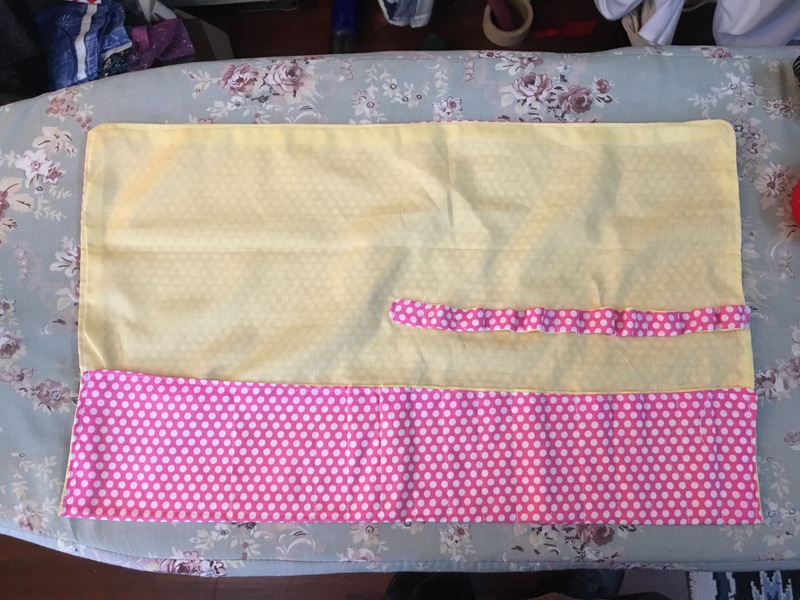 I’ve been using it to make tool rolls out of fat quarters of quilting fabric, with the intention of making about 10-20 of these for friends’ children who are going back to school. 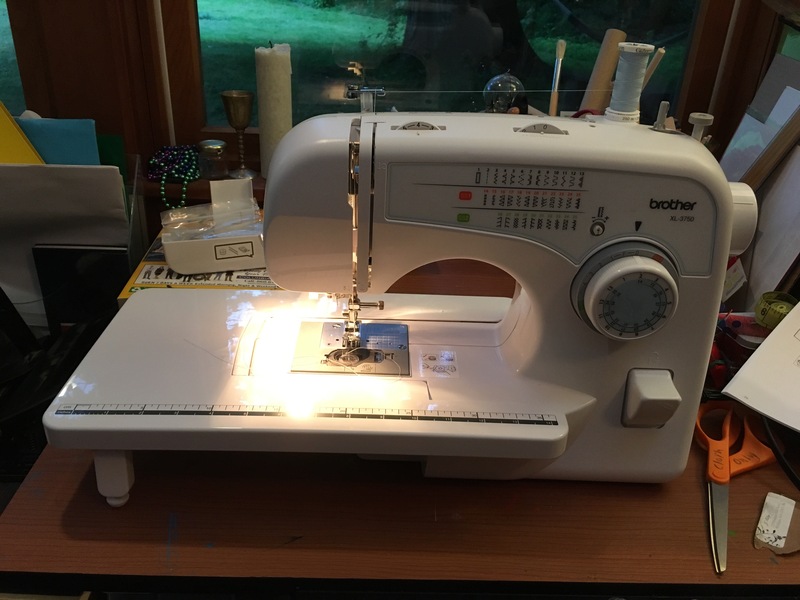 They’re small projects; they allow me to practice certain skills with my new sewing machine and get used to how this machine works; and they allow me to create things that I don’t then have to keep for myself — they’re easily given away. A Fat Quarter generally costs around $2.50, so these are around $5.50 in materials (including thread) and maybe $10-15 in my time… time that I’d have to spend anyway, practicing the skills I want to be practicing. 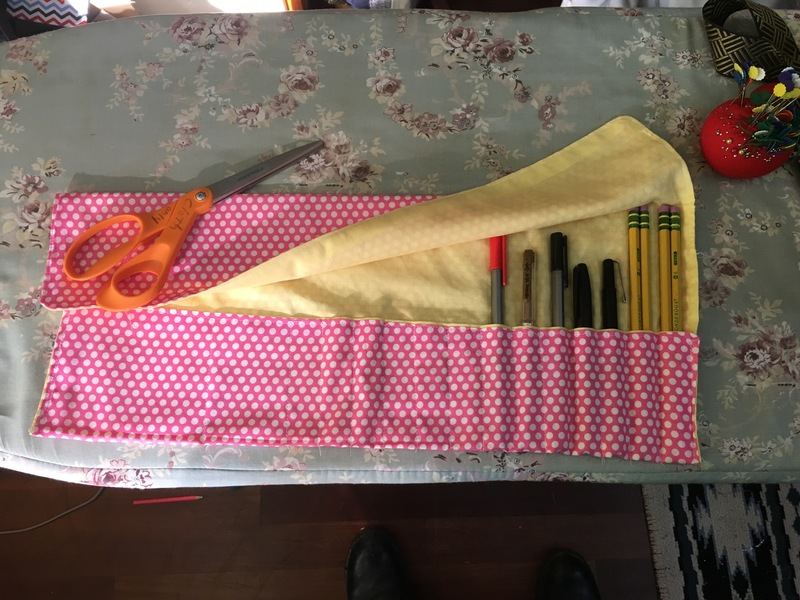 The idea is that many children are not able to manage the ‘bunched-up’ mess of a pencil case. Too many tools squeezed into too small of a bag results in a lot of broken pens and pencils without points or erasers. 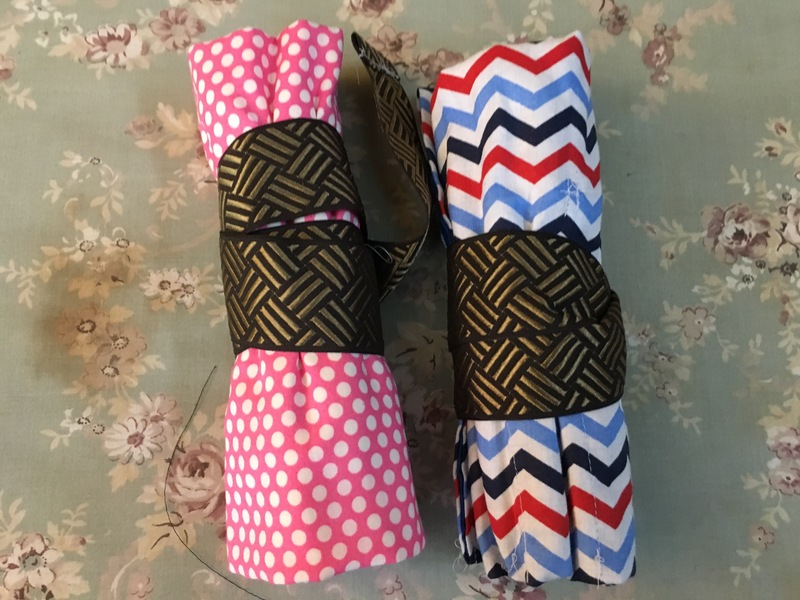 The tool roll consists of two fat quarters of fabric cut and trimmed to match each other, sewn together and turned. One end is folded over and seamed to create pockets or tubes for individual pens and pencils; the other end folds over to form a protective cover for the tools inside. It’s better to introduce students to the idea of order and structure for tools, early. So in a tool roll, each tool has a place: this place for a pen, this one for a pencil, a ruler here, a compass here. THere’s a ribbon or a band or a string on the outside, that allows one to close up the tools neatly inside, as well. This is ribbon left over from a fancy men’s clothing store in New York, from whence I received several nice birthday shirts over the years. I’ve saved all that ribbon, never knowing what to do with it. Now I know: Tool Rolls. There’s a second band inside each tool roll, as well: two strips of fabric left over from the cutting/trimming process, sewn together and turned. This is then sewn down to match the tubes/pockets on the lower half of the outer shell. The result is that each pencil or pen has its place in the case/roll. By teaching children to order their tools in some sort of careful way, we teach them to need fewer of them, to treat them responsibly as tools, and to know how to store tools effectively. It helps them be organized, it helps them know exactly how much of each tool to carry, and it helps them know when a tool is worn out or broken and needs to be replaced.